Well hello and Happy Friday everyone! 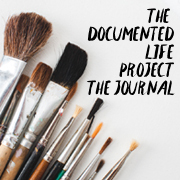 Today I've got another Documented Life Project journal page to share with you. After all, isn't that what DLPFriday is for? So this page is all about Focal Points and Layers. Y'all know I never have any issues with my layers but sometimes my focal point can get lost. This spread for example... there are two major focal points that even my eyes have trouble bouncing between.... my big clock and the "white space" that is the bird and note on my envelope. but as you can clearly see, there are so many more layers involved. There was the first layer of Ultramarine Blue and Prism Violet rolled on by brayer. Then a layer of gesso. There was the layer of Light Blue Permanent through a TCW Harlequin stencil and a layer of TCW Tiny Circles with Rouge (a red-violet) acrylic. Once dry, I brayered a small amount of Titanium White in a few places to brighten things up before adding any more. After the white, I added Dina Wakley's Lemon and Lime with a brush. Using a Heidi Swapp stencil and some Magenta acrylic, I pounced a lattice pattern in a couple of places. I doodled a little bit around the edge of a few lattice bits with my white UniBall Signo. For my next layer, I used TCW Screen Print and Carbon Black acrylic. And because I couldn't be satisfied with just those "few" layers, I added a final stenciled layer of Vibrant Turquoise Dylusions paint and the Honeycomb stencil by Prima. I again outlined a few of those circles using my UniBall Signo. After all of those layers, you think I'd be done, right? Of course not! Now it's time for oodles of Ephemera! I took an old dictionary page and cut an 8" circle using my Cricut (love that machine!). I colored it using Distress Ink in the spritz, smoosh, dry, spritz, smoosh, dry technique that I love so much but don't know the official "Tim Holtz" name for! I used the 7Gypsies Numero stamps to add the numbers which I outlined with my UniBall Signo. The hands on the clock were cut from mixed media paper using the Array of Arrows stencil and colored using Vibrant Turquoise paint and the turquoise Souffle pen. The tiny brad with heart was from my stash. I glued the whole clock down using Tacky Glue. I only put the brad through the clock and hands... I did not push it through the previous page. I added various other ephemera from my stash including an actual postage stamp. Around all of my ephemera, I used a Stabilo pencil smudged with water. I just used an Elmer's Craft Bond gluestick to glue all my bits and tacky glue for the kraft envelope. I added a few strips of turquoise striped washi and some Tim Holtz Remnant Rubs as well as stamped "tick" and "tock" on the clock and the sentiment "Time Keeps On Ticking Away" using Dylusions Alphas outlined with my UniBall Signo. Even with ten thousand layers, I really like how the envelope and the clock stand out from everything else. Even my sentiment blends back a bit. This page is super busy (like most of my pages), but I like to think it's interesting. No matter where you look, you'll find something! Well that's my share this week! See you next time around. 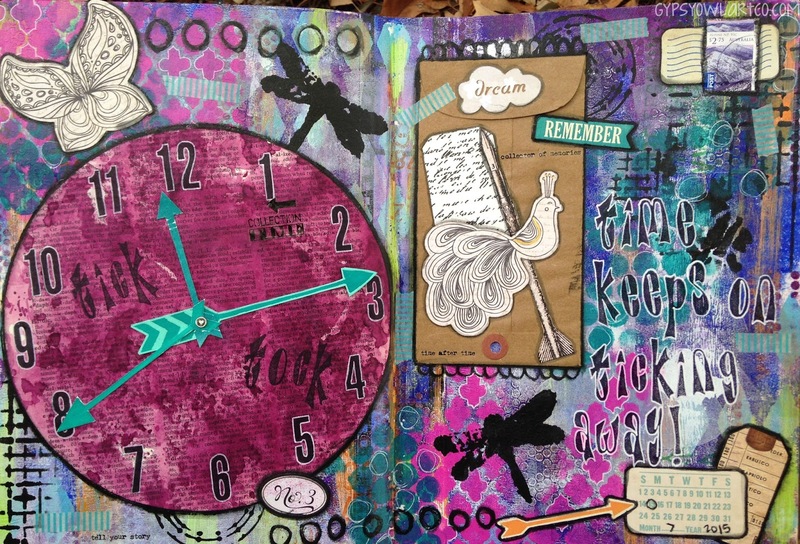 As always, I'm linking up with Julie Fei-Fan Balzar's Art Journal Every Day weekly link up!